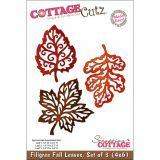 CottageCutz Filigree Fall Leaves Die - COTTAGE CUTZ: Cottage Cutz Dies. With design styles that are cute and adorable, fun and whimsical, and classically elegant these universal wafer-thin dies make a great addition to your paper crafting supplies. Cut amazing shapes out of paper, cardstock, adhesive-backed paper, vinyl, vellum and more. They are made from American steel and will work with the QuicKutz Revolution, CuttleBug, SpellBinder Wizard, AccuCut Zip'eMate, and Sizzix BigShot and BigKick machines (all sold separately). The die is a solid steel plate with multiple cutting images and comes with a layer of ejection foam to give clean and accurate cuts. 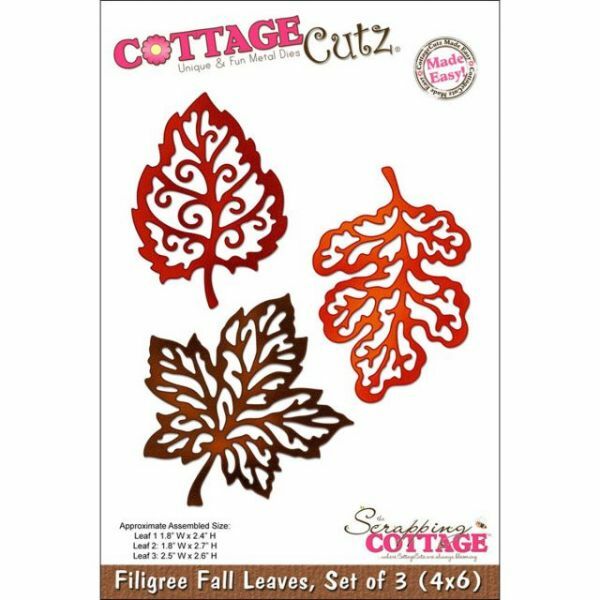 This package contains Filigree Fall Leaves (a Made Easy design). Die size: 6x4 inches. Made in USA.